HEIRLOOM. An old, dual purpose French variety (Dragon Langerie). Dragon's Tongue Wax is an old, dual purpose French variety (Dragon Langerie) with gorgeous pods that are yellow streaked with purple. 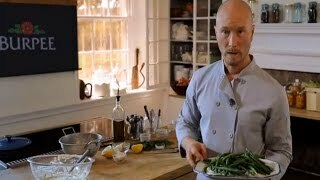 As snap beans, the pods turn all yellow after cooking, but they're delicious as shell beans too. Bean Shell, Bush Dragon's Tongue Wax is rated 4.8 out of 5 by 5. Rated 5 out of 5 by Queengerbil from Very tasty! Not only do these beans look really fun, but they taste amazing. Best beans I've ever eaten. Rated 5 out of 5 by brenlskmd from Favorite bean! Bought these for 2017 and absolutely loved them! Tender, buttery, mild flavor. Our new family favorite. Rated 5 out of 5 by Esteban from Favorite Bush Bean This bean is promoted for its looks, but its quality as an eating bean must be emphasized instead. We have a spring-early summer gardening season and a late summer-late fall gardening season here. Last year mid-summer temps exceeded 100 degress for months! Dragons Tongue was promoted for the fall season. They grew well, look as advertised, and what I want to emphasize is their flavor: excellent! 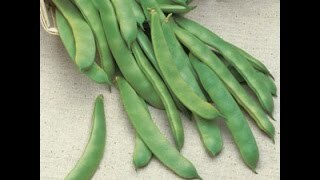 ...and their most remarkable quality: their excellent consistency...unlike many beans these are tender and REMAIN CRISP after cooking...this is the only busy bean I would grow now...just wish they were available as a pole bean. I will try crossing some with my pole beans and see if that can be bred in. I am trying them during the spring gardening season to see if they do as well as they did last fall. I read the other review bemoaning the appearance of the beans when canned...in truth few colored pod beans hold their color when cooked...but few taste as good as Dragons Tongue and none I know of stay tender AND CRISP when properly cooked! Rated 4 out of 5 by Kakie from Garden to Canning I was so smitten with the delightful colors of these beans on the packet, I simply had to buy them. The fact that it was a Burpee product and an heirloom to boot were just extra pluses. They grew beautifully on their bamboo tripods we made for them and the beans were gorgeous and loaded on the vines. My heartache occurred tonight when I canned my first 7 quarts - all of those gorgeous colors gone! Left in my jars were tannish/yellowish pods with no sign of the wonderful purple streaks, which were shining brightly thru the jars before going into the pressure cooker. I was hoping to blow away our fair officials - maybe I can still salvage 15 beautiful raw pods to show in that category, so the world can still see their true beauty.